This stainless steel cleaner takes a plant- and bio-based approach to cleaning up in the kitchen. The non-toxic, eco-friendly formula is made with coconut oil and leaves a streak-free glossy finish while it repels fingerprints, dirt, and dust. Essential oils provide a light, subtle fragrance. Made in the USA and includes a microfiber polishing cloth. The stainless steel in our kitchen has never looked so good. Easy to apply - no streaks - and even smells nice. This is the best stainless steel cleaner I have ever purchased. Absolutely leaves NO streaks. 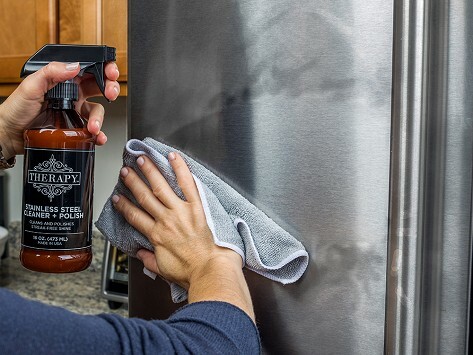 Best stainless steel appliance cleaner I have ever used!